Dutch Iris growing geophyte of the genus Iris and also known as Holland iris, Dutch Iris perennial plant summer deciduous and used as ornamental plant, can grow in mediterranean, subtropics or temperate climate, in temperate climate need to take bulb out of the ground in the winter and growing in hardiness zone 5-10. Flower color can be: blue, purple, orange, white, maroon, yellow, can be more than one color on the flower. The flower has 6 petals: in the outer circle 3 with different inner color mostly yellow, the inner petal is on the outer petal sometimes the colors of the inner and the outer petals different. 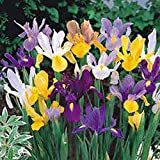 25 Dutch Iris bulbs, Bronze Blend, Rich, bronze colored Irises ! 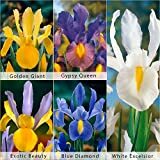 Dutch Iris bulbs,10 Bronze Blend, Rich, bronze colored Irises ! Blue, purple, orange, white, maroon or yellow flowers, can be more than one color on the flower. 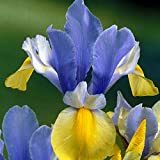 The flower has 6 petals: in the outer circle 3 with different inner color mostly yellow, the inner petals are on the outer petal sometimes the colors of the inner and the outer petals different.